The study area lies on the northern flank of theEast Maui Volcano (Haleakala) and covers about129 square miles between the drainage basins ofMaliko Gulch to the west and Makapipi Stream tothe east. About 989 million gallons per day of rain-fall and 176 million gallons per day of fog dripreaches the study area and about 529million gal-lons per day enters the ground-water system asrecharge. Average annual ground-water with-drawal from wells totals only about 3 million gal-lons per day; proposed (as of 1998) additionalwithdrawals total about 18 million gallons per day.Additionally, tunnels and ditches of an extensiveirrigation network directly intercept at least 10 mil-lion gallons per day of ground water.The total amount of average annual stream-flow in gaged stream subbasins upstream of 1,300feet altitude is about 255 million gallons per dayand the total amount of average annual base flow isabout 62 million gallons per day. Six major sur-face-water diversion systems in the study area havediverted an average of 163 million gallons per dayof streamflow (including nearly all base flow ofdiverted streams) for irrigation and domestic sup-ply in central Maui during 1925–97.Fresh ground water is found in two mainforms. West of Keanae Valley, ground-water flowappears to be dominated by a variably saturatedsystem. A saturated zone in the uppermost rockunit, the Kula Volcanics, is separated from a fresh-water lens near sea level by an unsaturated zone inthe underlying Honomanu Basalt. East of KeanaeValley, the ground-water system appears to befully saturated above sea level to altitudes greaterthan 2,000 feet. The total average annual streamflow of gagedstreams west of Keanae Valley is about 140 milliongallons per day at 1,200 feet to 1,300 feet altitude.It is not possible to estimate the total averageannual streamflow at the coast. All of the base flowmeasured in the study area west of Keanae Valleyrepresents ground-water discharge from the high-elevation saturated zone. Total average dailyground-water discharge from the high-elevationsaturated zone upstream of 1,200 feet altitude isgreater than 38 million gallons per day, all of whichis eventually removed from the streams by surface-water diversion systems. Perennial streamflow hasbeen measured at altitudes greater than 3,000 feetin several of the streams. Discharge from the high-elevation saturated zone is persistent even duringperiods of little rainfall. The total average annual streamflow of thegaged streams east of Keanae Valley is about 109million gallons per day at about 1,300 feet altitude.It is not possible to estimate the total averageannual streamflow at the coast nor at higher alti-tudes. All of the base flow measured east of KeanaeValley represents ground-water discharge from thevertically extensive freshwater-lens system. Totalaverage daily ground-water discharge to gagedstreams upstream of 1,200 feet altitude is about 27million gallons per day. About 19 million gallonsper day of ground water discharges through theKula and Hana Volcanics between about 500 feetand 1,300 feet altitude in the gaged stream sub-basins. About 13 million gallons per day of thisdischarge is in Hanawi Stream. The total ground-water discharge above 500 feet altitude in this partof the study area is greater than 56 million gallonsper day. 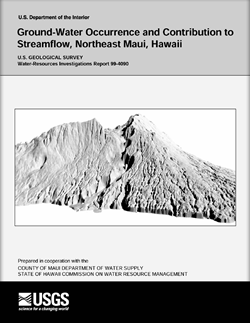 Gingerich, S.B., 1999, Ground-water occurrence and contribution to streamflow, Northeast Maui, Hawaii: U.S. Geological Survey Water-Resources Investigations Report 99-4090, 69 p.